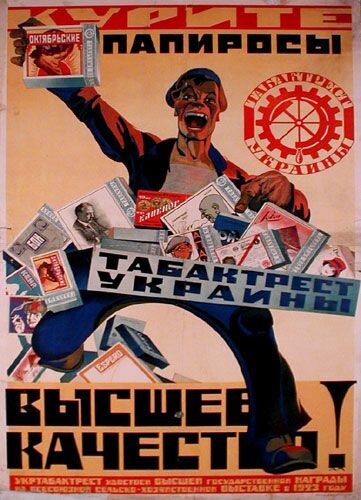 I decided to take designs of Soviet ads at the beginning of 20th century. Also, I took a cover of a French magazine "Esquire". The design dates to 1960s. This is the ad of a soap. 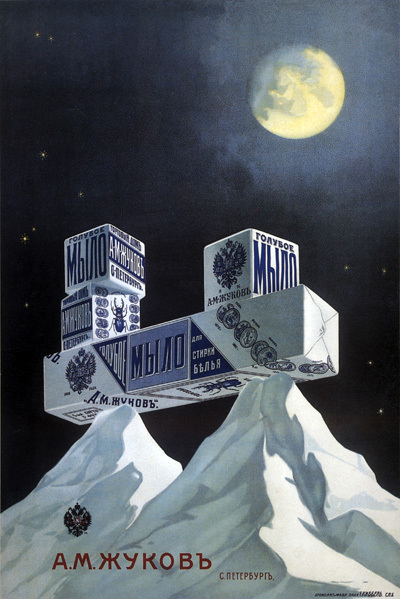 I think it is a good one, as it is harmonius, unusual - soap is placed on snowy mountains which is unexpected and makes people associate it with snow, white, clean... The soap is situated in the middle of a picture which makes us pay attention to it, but at the same time this position is not very obvious, as it is in harmony with all the other objects in the picture. At the same time the style of the poster gives the eye a flow from the moon down to the soap, mountains and the brand, which is wisely written with warm color on the picture made of cold colors - this makes contrast and emphasises the brand better. The cover of a French men's magazine "Esquire" is also very interesting. It clearly and in unusual way delivers its message "The Magazine for Men". The space is used wisely, the eye flows from the heading to the picture of a man, his eyes direct us to a woman, who is going away of the page. The idea is great, the unexpectedness and curiosity would attract a reader. This is the ad of the cigarettes which I consider to be bad. There is no certain emphasis, all the elements are emphasised - cigarettes, text, the man, the brand... Though the flow here is perfect, the overcrowdness of the picture makes feel uncomfortable. This is the ad of pacifiers. It is not only scary, but also contrasting colors in such a context make me feel uncomfortable. May be this ad would be perfect for something else, but not for pacifiers. The attention is attracted to a huge head, at the same time pacifiers in its mouth remain unnoticeable.